The disclaimer here is that I've got no intimate knowledge of Tim Tebow as an individual. But as an avid fan of the sport of football and as a Christian, I've heard a great deal of the hype about him and the conversations concerning his faith in Christ. Writing a serious post about Tebow feels a bit like trying to analyze the theological and philosophical depth of "Friday" by Rebecca Black (look it up on YouTube), but since it's so publicized, it's worth offering some thoughtful feedback. Most people don't seem to understand why I don't like Tebowmania and why I'm so sick of hearing about him. It probably has something to do with the fact that he's not an exceptionally good quarterback and yet every time I turn on Espn, I've got to hear about Tebow... there are a few other quarterbacks in the league and some of them are actually playing pretty good football. It probably also has something to do with the fact that I'm a Charger fan and he plays for the Broncos... But more significantly, I'm frustrated with the way his faith is talked about. As a Christian I find it patronizing that his "Tebowing" antics have become a joke when, in fact, guys all around the NFL have prayed before games since the league's origins. And there's some substance to prayer beyond the sport of football. I think his popularity as a Christian plays into the status quo, the popular perspective on Christianity, namely that it's essentially without substance and involves being "unashamed" and being a nice person and little else.... Oh, and voting republican. The truest testament to the Christian faith is not in stories of successful athletes or rock stars. The truest testament of the Christian faith is and always will be in the stories of those who take up the cross and follow Jesus among and on behalf of the least of these. The truest witness should not be people who talk about Jesus a lot, it should be the people who bear his image with their flesh, their hands and their feet. If I'm being honest, my beef is not with Tim himself. It would be quite hypocritical of me to pass judgment on him as an individual. My real beef is with what has become the accepted cultural evidence of a person's faith. His example, to me, represents the status quo... a superficial sort of Christianity (not that Tim is necessarily superficial in his own faith). 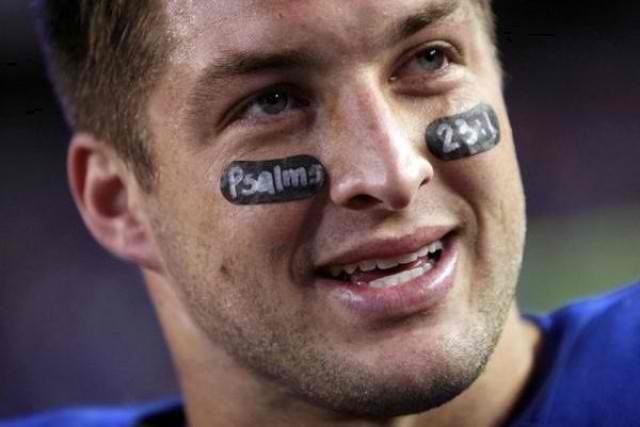 What if Tebow's work in helping orphans was the real testament of his faith in Christ? and he should consider playing Tight End... Really.